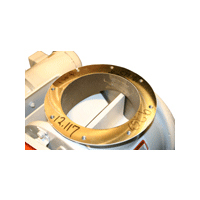 Kice VD airlocks are fabricated valves with a jet-under design. 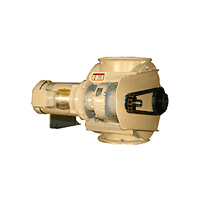 They are used for products that are not easily injected into a pneumatic conveying line. The jet-under design efficiently ‘clears’ each rotor pocket as it passes into the air stream. 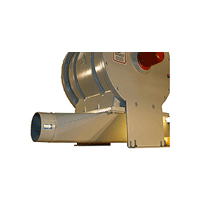 They can not be used in sequence on the same pneumatic conveying line. They must be the only valve on the line or the first in sequence. 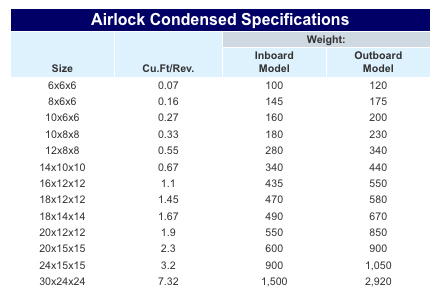 This airlock is also available with outboard bearings (VDOT). 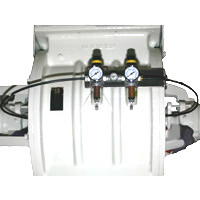 Kice Airlock Drives are nearly always supplied with a premium grade, parallel shaft, C-Face gear motor. These parallel shaft assemblies are typically over 97% efficient compared to about 60% efficiency on right angle gear motors. Chain drives with Kice guards painted OSHA orange are standard. Adjustable Motor Mounts for tensioning chains are standard on most Kice airlock assemblies with gear motors. 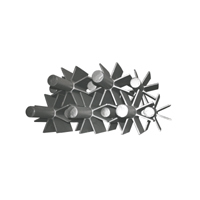 Trailing Edges Relieved (TER) is a process that machines the ‘back side’ of the rotor tips and sides to a 45 degree angle and reduces the surface area of the tip, lessening the chance of airlock binding when handling sticky products. Inlet Plows are standard on Kice cast iron valves. This creates a scissor action as each rotor blade enters into the housing. This reduces the likelihood that a piece of product will bind an airlock in the ‘nip point’. Standard Kice Rotors on all valves are cast iron and precision machined to match each valve body for efficient performance and long life. Standard rotors have open ends and are full depth. Standard rotors have 8 blades. 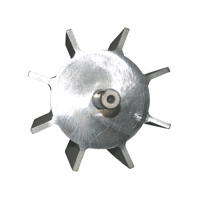 Bolt-on Rotor Tips are available in an assortment of different materials depending on the material being handled. 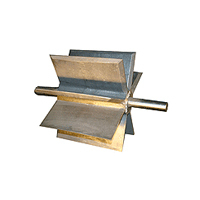 AR steel tips can be used for abrasive material. Flexible urethane tips can be used for fibrous materials that can choke a valve. Special Clearances between the rotor blades and the housing are engineered for specific temperature and product concerns. Square and Round inlets/outlets are available on most models of Kice airlocks. Shallow Depth Rotors are available for precision flow control. Coating and Plating such as hard chrome, nickel and Teflon® can be applied to machined surfaces inside Kice airlocks for special product requirements. 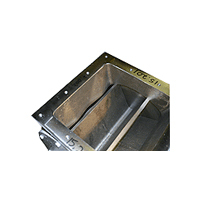 Bolt-On Pans are used with drop-thru style airlocks that are used to feed pneumatic conveying lines. Air Purge Seals are available on outboard bearing airlocks which further help to keep product away from bearings. 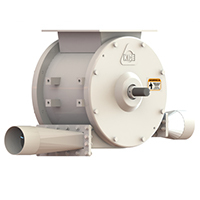 Kice Surge Hoppers are used on the inlets of airlocks that feed pneumatic conveying lines. 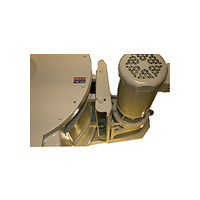 Surge hoppers provide a clear path for airlock bypass air to leave the product stream relatively slowly without carrying product with it. 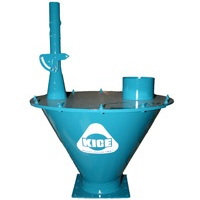 Kice Surge Hoppers are available as round or square units depending on the application. 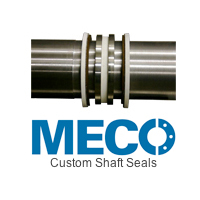 The MECO-Pac is a double-faced, mechanical seal that eliminates shaft wear. This proven seal combines food-grade materials with industrial-strength design. The MECO-Pac offers excellent abrasion resistance at temperatures up to 500ºF. A low-pressure, low-flow air or gas barrier keeps process isolated from atmosphere, and helps predict maintenance intervals. Inlet Shunts are used to keep product out of the ‘nip point’, the area where the rotor enters into the housing. HTD or COG Belt Drives are available upon request. 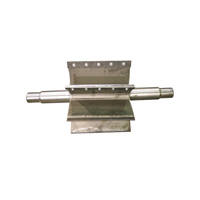 Materials of Construction include cast iron, fabricated steel or stainless steel.